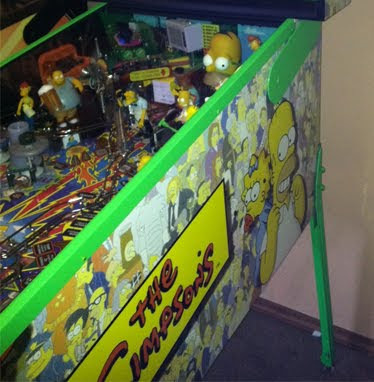 Back Alley Creations: Simpsons Pinball Hardware is done!!!! A while ago I had started playing with a nuclear green powder coat and a glow additive. I was able to make it glow but when the game is on you do not see it glowing. The lights from the backglass and playfield are to bright. The only time you would see it glow was when all lights and games where off. With that in mind and the legs not always getting enough light to glow bright enough we have decided to offer it in the Nuclear Green but without the glow. If however you would still like to glow in it we can do that for an upgrade charge. Hope everyone likes the new Simpsons Nuclear Green Hardware!!! You can find out more info on it by visiting our website.